From Chinua Achebe, father of modern African literature, comes a vivid fable about power and freedom. In the beginning, all the animals lived as friends. 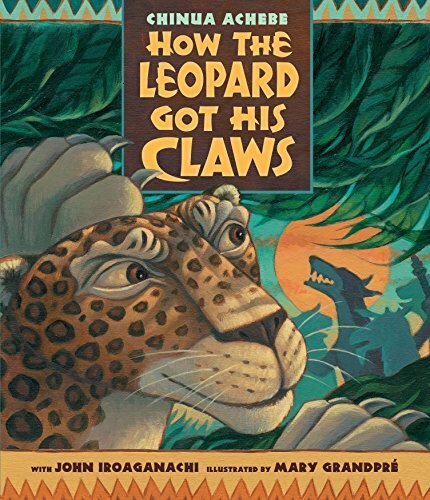 Their king, the leopard, was strong but gentle and wise. Only Dog had sharp teeth, and only he scoffed at the other animals’ plan to build a common shelter for resting out of the rain. But when Dog is ? ooded out of his own cave, he attacks the leopard and takes over as king. And it is then, after visiting the blacksmith’s forge and knocking on Thunder’s door, that the angry leopard returns to regain his throne by the menace of his own threatening new claws. In a riveting fable for young readers about the potency and dangers of power taken by force, Nigerian writer Chinua Achebe, author of THINGS FALL APART, evokes themes of liberation and justice that echo his seminal novels about post-colonial Africa. Glowing with vibrant color, Mary GrandPré’s expressive and action filled paintings bring this unforgettable tale to dramatic life.